Boise-Eliot/Humboldt School study and weigh in on the problem of sea lions eating salmons in the Willamette and Columbia rivers. Second-grade students at Boise-Eliot/Humboldt School in Portland spent most of the year studying oceans, marine animals and beach shorelines. The students were interested in a Tribune article about sea lions swimming up the Willamette and Columbia rivers and threatening some of the fish species that lived there. They looked up a map of the threatened areas, and made a giant salt-dough map model so they could study the problem, form opinions and create some solutions. 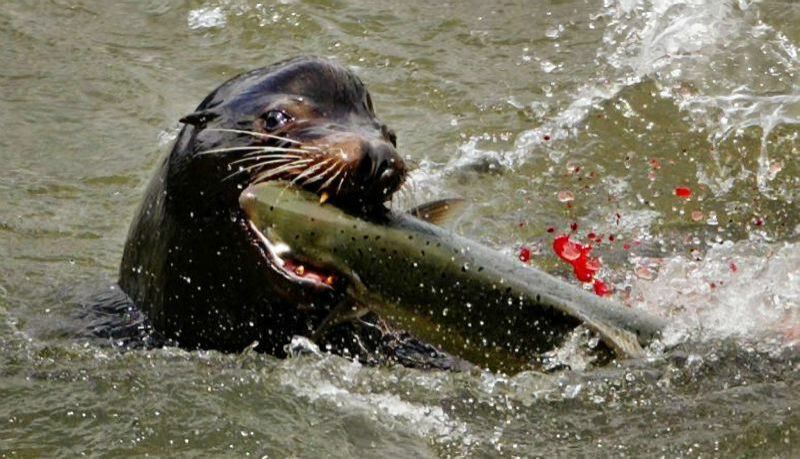 I think it's a good idea to kill the sea lions because they're eating all the fish in the river. We could get a cage inside so the sea lions don't eat the fish. I think they should not kill the sea lions. It's sad for them because they don't want to die. All animals want to be alive. We shouldn't kill the sea lions because you can just take them to another place. My plan is to put water in a big truck and drive them to Hollywood. I think we should kill the sea lions so they will not eat all the fish in the river. We should take off the law about not killing marine life so we can take care of this problem. Then we can put the law back on. We should block the sea lions from the fish and kill them. We should give the sea lions dead fish that people already killed. Sea lions should be killed! I think they should not kill the sea lions. They need to live forever. Don't take them; they will be extinct. They are awesome, but they need to eat. The government should not kill them. A good plan is to share the fish so they can each get some fish, too. 1.) Get all the salmon together. 2.) Put them into four groups of 10. 3.) Cut the salmon in half so they can share the fish into four equal groups. It's a good idea to kill the sea lions at Willamette Falls so they can stop eating the fish, so the fish can live and grow up and have a good family so they would have a good life. My opinion is that we should not kill the sea lions because they will be extinct. It might break peoples' hearts because some people, like me, like all animals. My opinion is that we should not kill them because they won't live, they won't eat and won't breathe. I think that we should take them to a zoo. Then they cannot eat all the fish and then the fish won't be extinct. So, we can take them to the zoo and then the fish can eat all the plants and plankton so we can have a healthier river. We can call the zoo people and say, "Can you come and get the sea lions so the fish cannot get eaten by the sea lions?" Then the zoo people will come and get the sea lions. I think it's a good idea to kill the sea lions. Because people can't catch fish in the water if the sea lions eat them all first. Fish want to be free and be able to swim. Fish want to have fun in the water. But they can't if sea lions keep eating them. I think a good plan would be to kill the sea lions while they're sleeping. This is a good plan because fish can be safe and have fun in the water. I will give them poisonous fish. Then they will wake up and eat the fish. Then the fish will be happy. I think it's a bad idea to kill the sea lions. I think it's a bad idea because it's mean to kill the sea lions. I think it's a bad idea because the sea lions will keep coming anyway. I think it's a bad idea because the sea lions want to stay alive. I think a good plan would be to move the fish to another lake. I think it's a good plan because you won't have to kill the sea lions. First, I would catch the fish, then move them to a different lake. Then, I would wait until the sea lions leave by looking in the newspaper. Last, I would catch the fish again so I can move them back to their original lake. It's a bad idea to kill the sea lions because they are going to be endangered too if we kill them. Also, the sea lions don't understand they are making the fish endangered. They also shouldn't kill the sea lions because we'll be the ones that are endangering the sea lions. A good idea is to divide the sea lions up and send them to different places. I think that's a good plan because they can send them to zoos, like you can send 10 to the Oregon Zoo. And maybe 10 to Six Flags, because it has a sea lion show, and they can train them to be in the show.